There are many ways to advertise with the National Association of Social Workers. Our thousands of members, customers and supporters will be interested to learn more about your educational, career, and practice development opportunities. 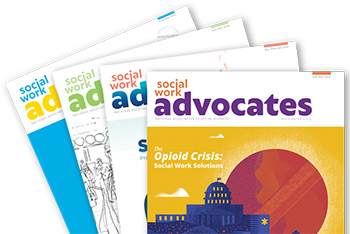 NASW's bimonthly magazine, Social Work Advocates, launched in August 2018. Note: NASW News published its final issue in July 2018. Contact Jim Snyder, advertising representative, to discuss your placement needs. Reach targeted groups of NASW members for marketing programs or research studies, through direct mail or email, by contacting our list rental partner InFocus Marketing. Every two years, NASW hosts a national conference in Washington, D.C., to bring members from across the country together to learn, network and celebrate with their social work colleagues. With live attendance of more than 2,000 and virtual attendance of 1,000, the NASW national conference is a must-attend event for many leaders in the profession. We also host multi-day virtual practice conferences in the alternate years. NASW’s national website provides resources for practicing social workers and their employers, students, human service advocates, allied professionals and the general public. It also serves as a portal to all 55 chapter websites. Publication of an advertisement does not constitute endorsement or approval of any product or service advertised, or any point of view, standard, or opinion presented therein. NASW Chapters give you access to members through print and email newsletters, website advertising, as well as conference sponsorship, exhibits and program advertising. Find out more by contacting the Chapter of your choice.